Author David Espinoza will hold a book-signing event at Big Town Hero. He would like to thank Scott White, the owner, for the use of his amazing soup-sandwich place. Stop by at your convenience, grab a sandwich, and meet the author, who has written a total of four books and one memoir. There is plenty of parking right in front of the venue. Date: Saturday, June 20, 2015 from 11:00 a.m. - 6:00 p.m. Directions: Keizer sits next to Salem - heading south off I-5 take Keizer exit, turn right go a couple of miles then left on River Road - go about a mile, it's on the right inside a mini-mall. 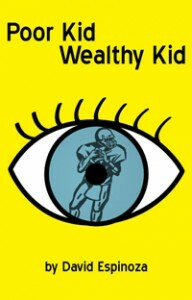 Poor Kid, Wealthy Kid was published in 2011 and is the first part of the new release. In this realism-fiction novel, a poor family packs up in Texas and moves to Oregon. Carlos has just graduated from the eighth grade and he's not too happy - Dimmitt, Texas, is a place one might call his comfort zone - his friends and a sports career were left behind. When he arrives at Gervais High School, his family is broke and the family struggles. He meets a very wealthy kid, Harv, in the berry field and becomes friends with him. When he meets his high school sweetheart (Liz), his disappointment takes a drastic turn. The only problem is the discrimination he faces from Liz Bradford's dad, Ted. This diverse story is about two cultures coming together. In addition, will Carlos and Harv help the Gervais Cougars make it to state? Spiral back to 1980 when kids were talking to each other instead of texting. In this Gervais High School story it's senior year. Carlos has several life-changing decisions to make. The Edmonton Eskimos, from the Canadian Football League, offer him a great deal. Liz Bradford has acquired two new friends, Kalin Jensen and Brianna Harper. Liz doesn't agree with Carlos going pro right out of high school. She feels that a college education is more important. Her brother, Harv, feels differently. Dirk Newman has graduated and continues to be the antagonist – a prejudiced bully that lingers around wanting Carlos to fail. This realism-fiction novel is about two high school sweethearts growing up and diving into the challenges of the world. The classroom, senior skip day, graduation, airports, a lost love, and the big game are all brought to life. After graduation day, Carlos and Liz are tested on how strong their love is for each other. Will Carlos accept a two-year contract to play professional football in the Canadian Football League? I wrote this two-part story with the consideration of all ages. I want everyone to enjoy a clean read that sends a positive message while delivering an education of true places in a fun way. I plan to have all of my books available for sale that day as well. I look forward to meeting you, if you purchase one of my books, you'll get a free DavidEspi.com pen.